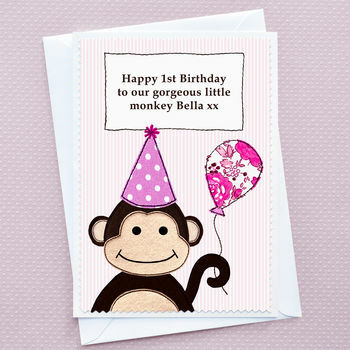 A gorgeous girls birthday card featuring a cute little monkey with balloon and party hat, perfect to celebrate a baby girl's 1st birthday. A beautiful large A5 sized girls birthday card which can be personalised on the front with your own text whilst the inside of the card is blank for you to write your own message. In pretty pastel pink, this sweet 'little monkey' design is suitable for all ages but would make a great baby's first birthday card. It would be perfect for a baby daughter, niece, granddaughter, goddaughter, cousin or sister, though the card can actually be personalised for any birthday, including but it can be personalised for all birthdays including 1st, 2nd, 3rd, 4th, 5th, 6th, 7th, 8th, 9th, 10th, 11th or 12th. The card would look lovely in a simple white frame, displayed in the nursery, bedroom or playroom of the baby girl. Happy Birthday Olivia 3 Today! Happy seventh birthday to our little monkey Mia! It would make a lovely personalised card for when a little girl turns one, two, three, four, five, six, seven, eight, nine, ten, eleven or twelve. This lovely printed girls birthday card is by Jenny Arnott Cards & Gifts. The print does retain some fabric textures which were used in the design, however the card is not actually fabric but is printed onto beautiful artisan paper, trimmed with a zig zag edging and attached to a 350gsm textured white card blank. Each card comes with a white envelope and is sent by first class post, protected in a clear cello wrapper and sturdy board backed envelope. This product is dispatched to you by Jenny Arnott Cards & Gifts. If you know you need a card for a specific upcoming occasion it is best to try and order in good time to allow for unforeseen postage delays. Cards are securely packaged in a board backed envelope to keep them safe and flat in transit. The package is small enough to fit through most normal letterboxes. Please double check your delivery details including full address and postcode at the checkout. It is the customer’s responsibility to ensure all details are correct. I cannot be held responsible for replacing or refunding an order where the card has been delivered to an old or incorrect address.